There is something about living shade, it is cool, relaxing, and elegant and every year it is fresh and new. 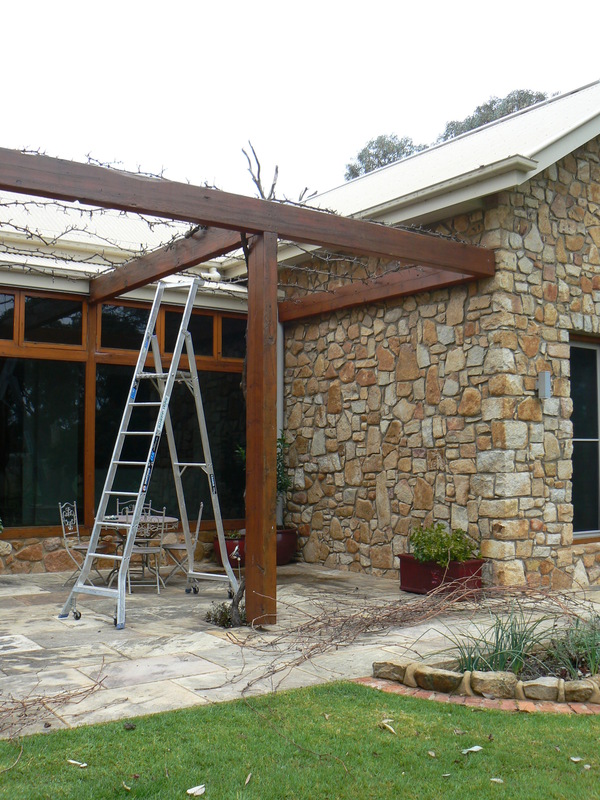 There are not many products in this world that come with a guaranteed replacement old for new, every year, for free, but that is what you can expect with deciduous climbers. 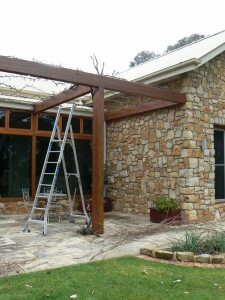 Here in south east Australia it is time to prune ornamental grapes to make way for new spring growth. Shade from living plants is so much more interesting to look at than dreary machine made shade cloth and sails that might look good for a few years but that eventually disintegrate in the sunshine leaving bits of plastic ‘dust’ to litter the environment. Instead of fixed and solid shade materials shade through leaves is always intriguing as there is always something changing with the sun, the light or the breeze. 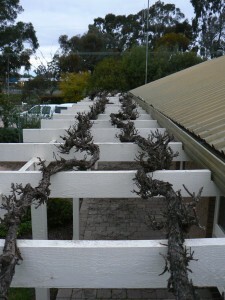 Once you have done the pruning you will be left with some long lengths of vine that can be up-cycled into something else. 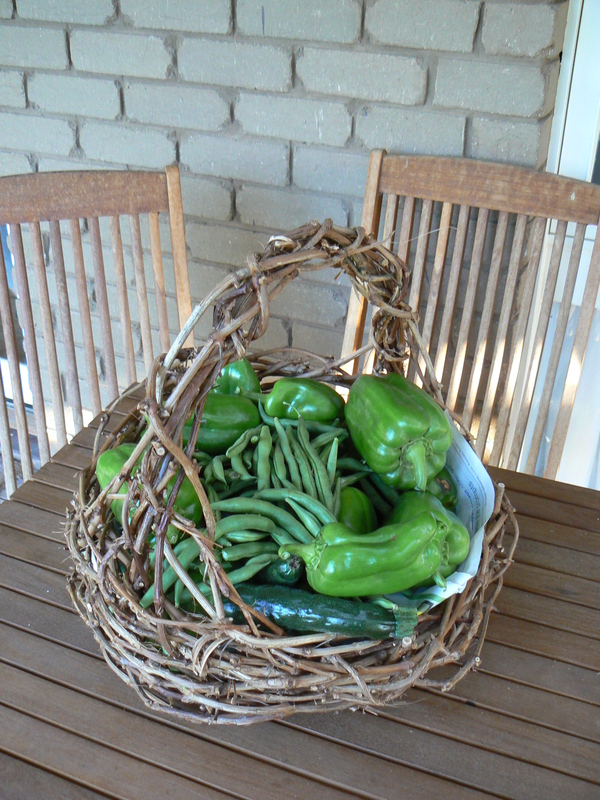 Weaving it is possible as you can see with the ball-vase and vegetable baskets I have made in the photos. The material is more stringy than stiff so the finished product always seems a little flexible even after a year. DO NOT create an overhead structure from a mesh or anything similar. If you can’t get up amongst it to prune you will end up with a tangled, twiggy mess. DO NOT plant too many for the space. 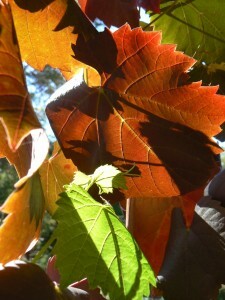 One ornamental grape will spread up to 20 metres or more. 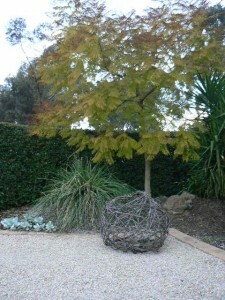 Allow space for an ornamental grape to spread six metres each way. DO NOT twin the stems around the posts of the structure and lay the main stems you are training along the top of the structure. Keeping the framework of the plant to the top and outside allows you to move the climber away to facilitate painting or maintenance of the structure. A well grown plant is likely to outlive any man-made structure so leave room for it to be replaced. As spring progresses to summer heat you have a choice to let the stems dangle down the edge of the framework like a curtain or trim it higher if less shade is needed. The curtain effect really emphasises the graceful weeping effect of deciduous climbers. How far from the main stem should the cut be made on previous years growth of ornamental grape vines when pruning and should the cut becloseto the new growth bud ? Cutting back to between 3 to 5 buds is good as a general rule. This will leave stumpy pieces about 6cm long at intervals along the main framework of branches. Typically the new growth will be from these stumpy pieces each year. If you have a young plant you will have a choice as to where you choose to develop these growing points. Thinning these points out to about 40cm to 60cm apart usually gives good summer shade. 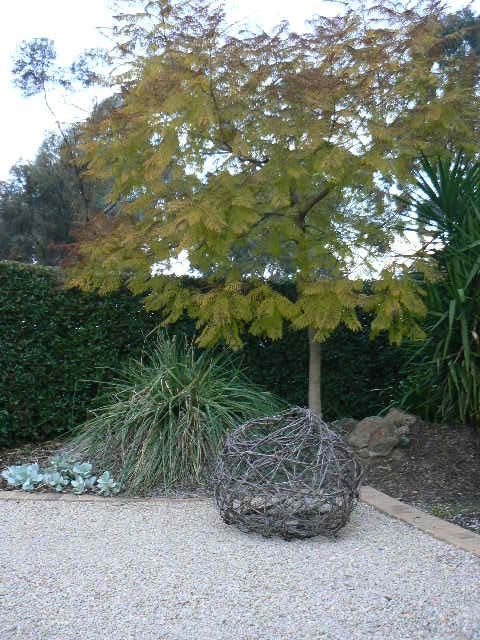 If you have a very old ornamental grape that is not very vigorous you might want to not cut back quite so hard, perhaps only to 10cm of what will be a stumpy cluster at each growing point along the framework. Best practice as you suggest is to cut so that you leave a bud at the end of the shoot with not much more than 5mm of stem after it. 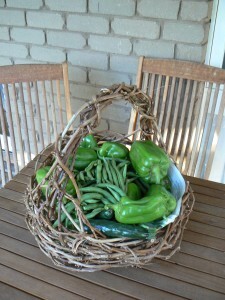 Now it is winter it is time to prune back and let the light in the winter sunshine. My ornamental grape has begun to “leak” immediately after pruning and has produced a huge quantity of oily water from one point. Is this usual? Should I try to stop it? Now that spring has arrived the plant is waking up after winter and the sap is rising. This is the case for all deciduous woody plants just before they start making new leaves and is normally not seen. It is a bit magical really to find out that plants are stirring after winter even when they still appear to be dormant. If you prune in winter the sap is down and the cuts don’t leak but if you prune when the spring temperatures are rising the cuts will leak, sometimes quite a lot. In Victoria it is normally best to get the pruning done in July or earlier (which is when the blog was first posted) as the weather is normally still cold. Pruning when the sap is rising probably wastes some energy stored within the plant but there is no need to worry as your ornamental grape is doing a normal thing and will stop dripping as it heals over, normally within a day. The sap is not likely to be oily more sugary so is easily washed away with water. What you are seeing are bunches of flower buds which is of no concern. Ornamental grapes still produce flowers and very occasionally develop some very small fruit if the weather suits. These don’t normally last on the plant. The lime green flowers that fall to the ground in spring are easily overlooked as a dusting of green that is easily blown away with a blower or swept up with a broom. 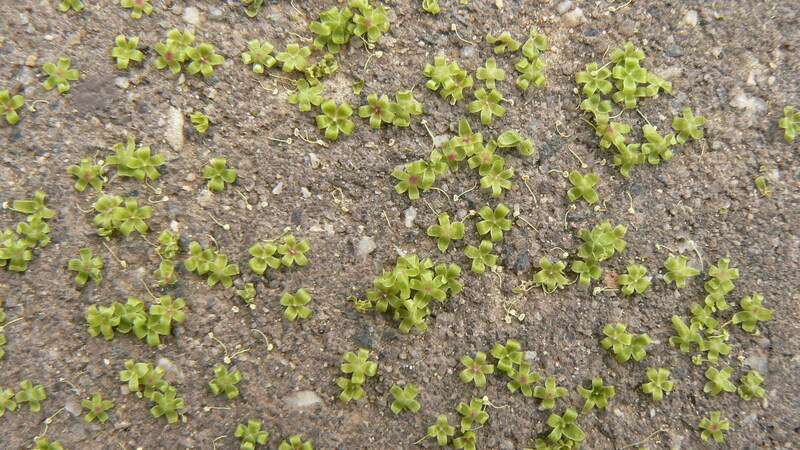 If you take a closer look the green ‘dust’ is a carpet of miniature flowers. That is one of the great things about the outdoors the more you look the more there is to see.